Maximum size: 25 mm (Brunckhorst, 1993). Identification: This species ranges from reddish-orange to yellow in Hawaii. There are numerous large, black spots on the notum. The notum also possesses small, simple, evenly distributed tubercles and three low, median longitudinal ridges. The rhinophores are the same color as the mantle. Natural history: On Maui, Phyllidia polkadotsa is a rare species that we haven't personally seen. However, it appears to be more common at exposed to highly exposed sites on Oahu and Kauai where it has been found under ledges and in caves from 5-23 m (16-75 ft). Scott Johnson also brought one up in a shelling dredge from about 70 m (230 ft). It probably feeds on an orange encrusting sponge. Distribution: Big Island, Maui, Oahu, Molokai and Midway: widely distributed in the western & central Pacific, also in the eastern Indian ocean. Taxonomic notes: This species is listed as the "yellow-black Phyllidia" in Bertsch and Johnson, 1981. 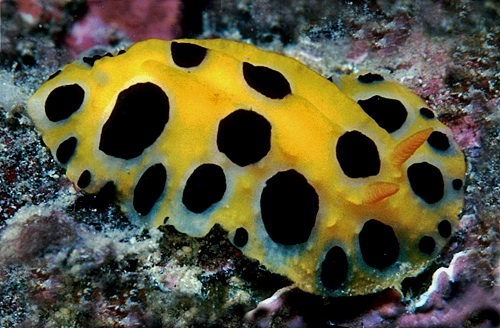 It was first recorded in Hawaii off the Waianae coast of Oahu by Scott Johnson and is referred to as the "polka-dot Phyllidia" in Hoover, 1998 & 2006. Photo: Scott Johnson: Makua, Oahu: Sept. 19, 1979.